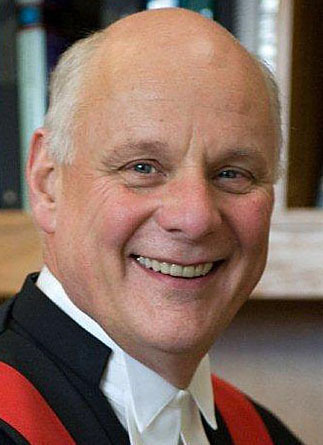 In the wake of the exposure of multiple egregious bail decisions by BC courts have reacted. Now, instead of serving the people, the courts have chosen to attempt to limit oversight of their actions. With that in mind, browsing through the Goldstream Gazette the other day I ran across an article that is very concerning. It is an article that should concern every member of the news media and every citizen who values transparency in government. I have quoted the article I read, in full. I urge you to not only read it. You should also make your opinion regarding it absolutely clear. Failure to do so may well result in your loss of rights to be informed because BC courts want their actions to be secret. and Shane Stanford. They want to do so without you being able to see the information that they ignored in those killers’ criminal and BC court records. One problem is that the information has been used by employers or landlords for criminal record checks that may find a charge but not the later acquittal. Another is posting the imposition of a peace bond, which can leave the false impression that someone has been convicted of an offense. Court Services Online has been available since 2008. It allows anyone to search by name or case number to find information on charges, court appearances and sentences. The online information is blocked if the accused is acquitted. It is also blocked if charges are withdrawn, a publication ban is ordered or when a pardon is later granted to seal the record of a conviction. Absolute discharge conviction records are removed from the public database after a year. Conditional discharges are removed after three years. A stay of proceedings means the online case file is blocked after a year. Although records for all cases remain at court registries for access in person. You need to see this article for what it is. It is a prelude to the courts denying the public access to what should be public information. It is bad enough that the courts are failing to protect us. Now, they want to hide their failures from us by not allowing us to see court records. Under the thinly veiled cloak of “criminal rights”, the courts want to keep you in the dark. They want to deny you oversight as to their actions. In essence, the courts want “Secret Tribunals”. The courts want to muzzle the media. 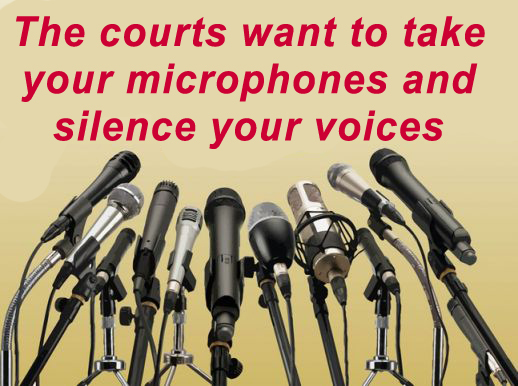 By controlling access to public information, the courts are silencing the media by controlling what the people hear. At its heart, this move by the courts makes the following statement. “Either you are too unenlightened to understand our actions or we are too powerful to have to explain ourselves to you“. The courts are part of government, and in Canada, government is accountable to the people. Perhaps Swedish philosopher Sissela Bok said it as well as anybody. “I believe that a guarantee of public access to government information is indispensable in the long run for any democratic society. If officials make public only what they want citizens to know, then publicity becomes a sham and accountability meaningless“. No justice comes from a dark courtroom. Imagine a world in which all decisions of a court are made in secrecy. Imagine a world in which nobody is allowed to understand on what reasoning courts reached their decisions because nobody is allowed to know the facts. Do you want to live in a world in which news media could only guess about those things? This is the world which the courts are thinking about creating. It is a world that Canadians gave their lives to avoid in two world wars. It is a world from which our brave men and women fought to free other people in other nations. I wrote the following email in response to the news article quoted. The Court, the Crown and the police all use public money to support a process that occurs in a public forum. Therefore, as a member of the public, I demand access. The only reasons to deny me would be for possible interests of personal, public, or national security. As a citizen I am absolutely entitled to insist that the information be published so I don’t have to traipse to the courthouse. No-justice-comes-from-a-dark-courtroom. To withhold such information from me on nothing more substantial than a “general rule” is tantamount to creating a secret system. Such a system damages the confidence of the public in our justice system. It does so because it creates an appearance of possible self protection by the courts. This is because it allows them to operate with no oversight. This is contrary to the principles of a free society. Please, I beg you, continue to honour the public’s ‎right to know. Do not even allow the hint of “secret tribunals”. Practicing what I preach, this email is being sent to a public official about a public matter. Therefore, there should be no “privacy” attached to it. Judges need to start protecting the public instead of the criminals and themselves. The BC courts need to remain transparent. If judges don’t want the public knowing about their bad decisions, then they should start making good decisions. Instead, they seek to hide their mistakes under the bed like an eight year old child. 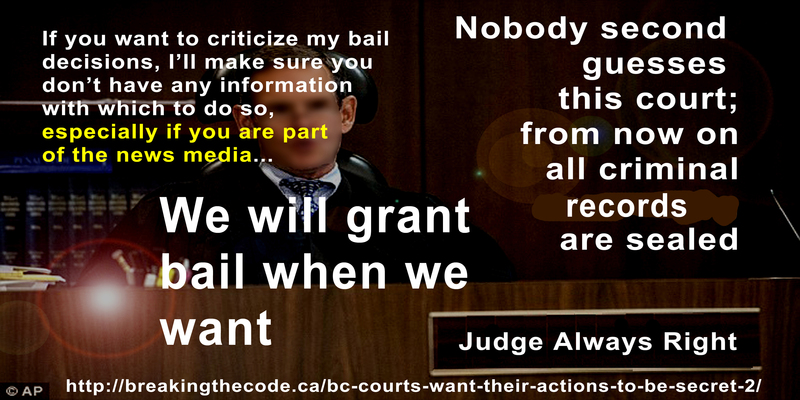 If news media doesn’t stand up to the BC courts now, they and you will have lost rights that will never return. For the past several years now I have watched the Times Colonist newspaper write bleeding heart stories about a drug dealer who was murdered doing a drug deal. It published a front page article lauding Langford Mayor Stew Young as gangs moved in and women were raped in parks. It even revealed to criminals that a mother who was a victim of a home invasion was cooperating with the police. All of that does not take into account the fact that it named my roommate as a witness in the murder trial of Wyatt Prince. It also reported that I was paid for my participation in events surrounding the investigation of that murder. It even gave the wrong amount of my pay. I detest the journalism, and I use that word loosely, that comes from that rag. However, I would not want it to lose the ability, should it ever choose to do so, to warn the public about what the BC courts are doing. It is time for the Times Colonist and every facet of the news media to “man up”. 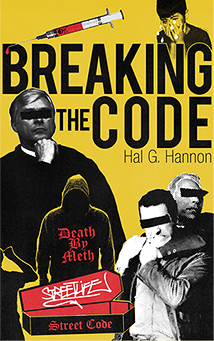 If you are connected with the news media, you need to let Justice Crabtree know that you will not tolerate him taking our knowledge from us. You need to tell him that the public has a right to know about matters that are financed through the use of public funds. He needs to be told there exists no compelling reason for the BC court decisions to be shrouded in secrecy. You need to tweet about it and to run articles in your print media. You need to talk about it on your talk shows and to do “hard” news pieces about it. Secrecy is the beginning of tyranny. A ruling denying you information to which you and the public are entitled is merely the first step on a slippery slope. It is a slope that could eventually lead to the media and the public not being allowed to criticize a judge or a court ruling. The courts know that you cannot criticize what you cannot see. Everybody, and that includes our courts, knows how complacent our public is. 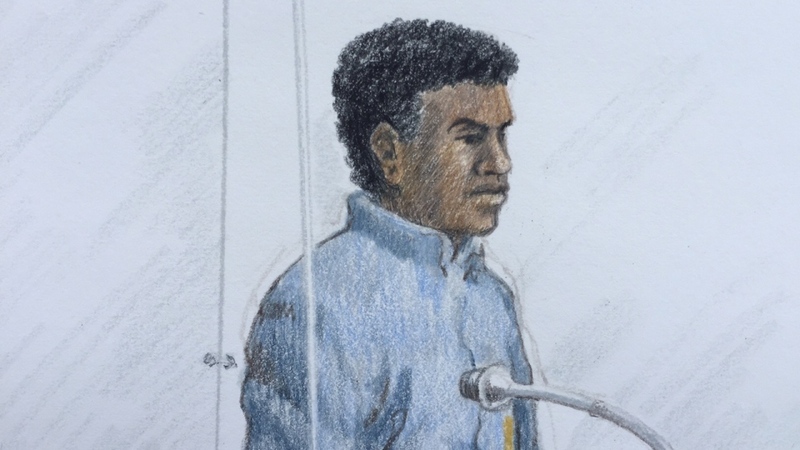 I believe that the BC courts are counting on you to do nothing. They are counting on you to not make your voices heard. They expect you to just shut up and be played for fools. Our courts can then say that they sought the public opinion and that there was no substantial objection. Why is something that has been right since 2008 suddenly wrong? That answer is, “It is not wrong“. It is simply that judges don’t want you to see. They do not want to have to answer to the public for their decisions. If you let the BC courts get away with this you have nobody but yourself to blame. Again, here is the contact information. Start a discussion or participate in one at the bottom of the page. If you like this article, please share it on social media with one of the links below. I don’t know your friends or family so it is up to you to share this with them. You must also make a noise with your public officials. All submissions must be received prior to September 18. WTH our justice system gives anything but justice! It seems it can also be bought and sold! I am thoroughly disgusted with our so called system! Our justice system is focused on finding the easiest way out instead of being focused on finding justice.